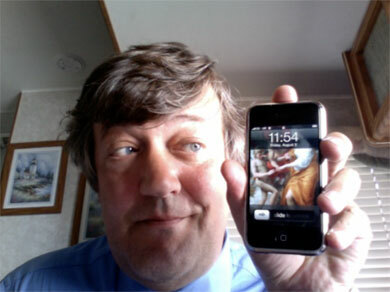 Stephen Fry is well known for his dedication to technology and until recently, his exclusive love of Apple products. The comedian/actor/blogger/tweeter boosted the profile of both HTC and the Android operating system when he published a tweet to his 1.5 million followers yesterday explaining that he didn’t just use his iPhone or iPad to update his Twitter account, at times deciding to use his HTC Desire handset to publish his tweets. 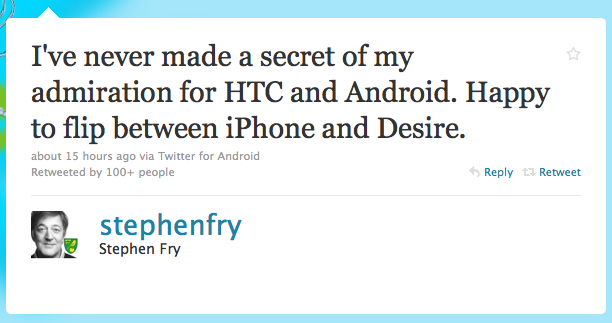 The tweet could be seen as an unofficial endorsement of the HTC Desire, prompting some followers to check out the handset. Others will see it as a complete non-news story. That, we leave to you to decide.